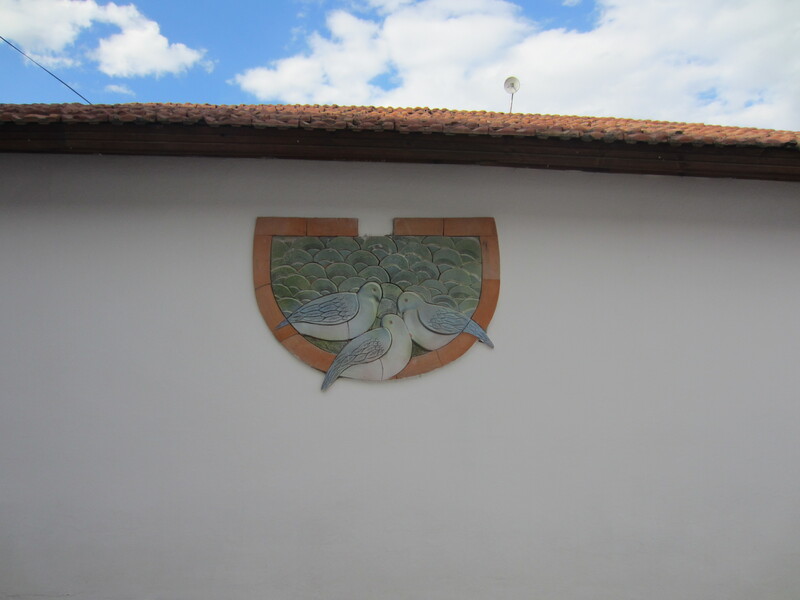 During the day on Saturday we visited Battalgazi (Old Malatya), an area rich with historic sites. 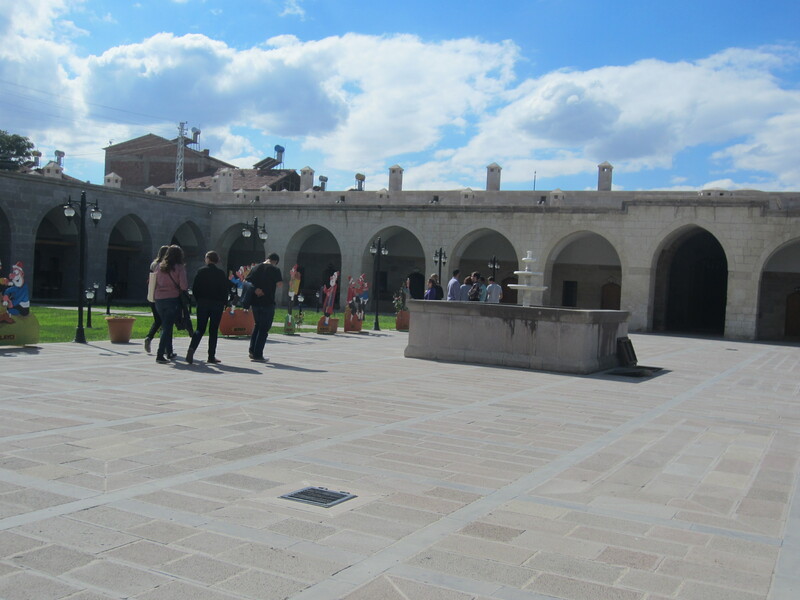 Our explorations started at Silahatar Mustafa Paşa Hanı, an old caravanserai dating from 1637 which now serves as a museum and fine arts school. (A caravanserai, in Turkish, Karvan Sarayi were roadside inns across the Middle East and Central Asia, particularly along the Silk Road, which served as hubs of commerical, informational and cultural interaction.) 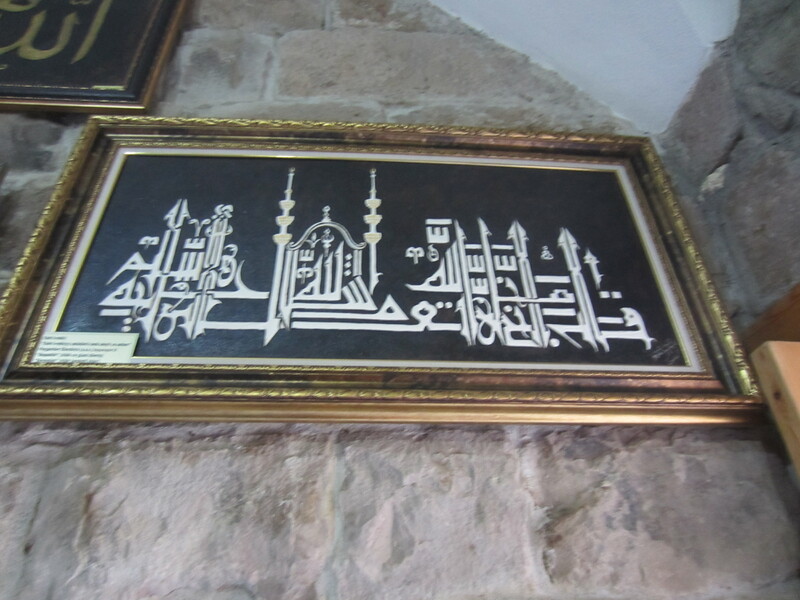 The caravanserai is named for Mustafa Pasha the sword-bearer (silahatar) of Sultan Murat IV. 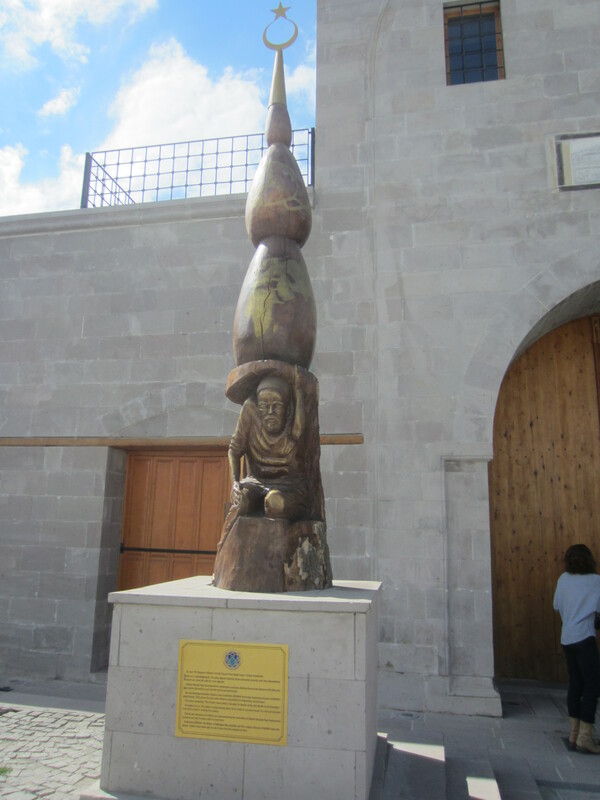 Outside the structure itself, we saw a statue symbolizing “The Erudite Human who is Carrying the Weight of Both Worlds on His Shoulders.” Standing at 4.5 meters, the statue was carved from a single intact tree, felled during the restoration of the caravanserai, which occurred from 2007-2009. While we were there, we were the recipients of an impromptu demonstration and lesson about ebru, a distinctly Turkish Islamicate art form. 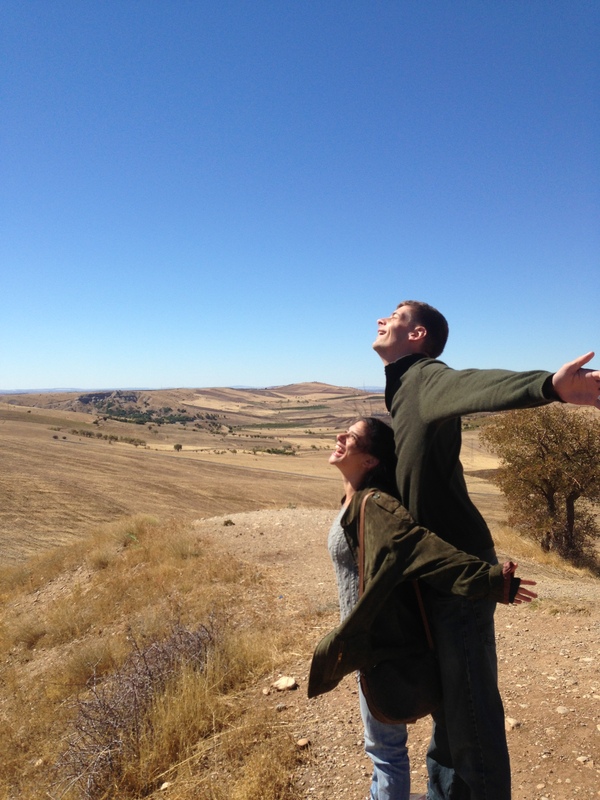 You can walk through the tutorial we were privy to and learn more about ebru here. 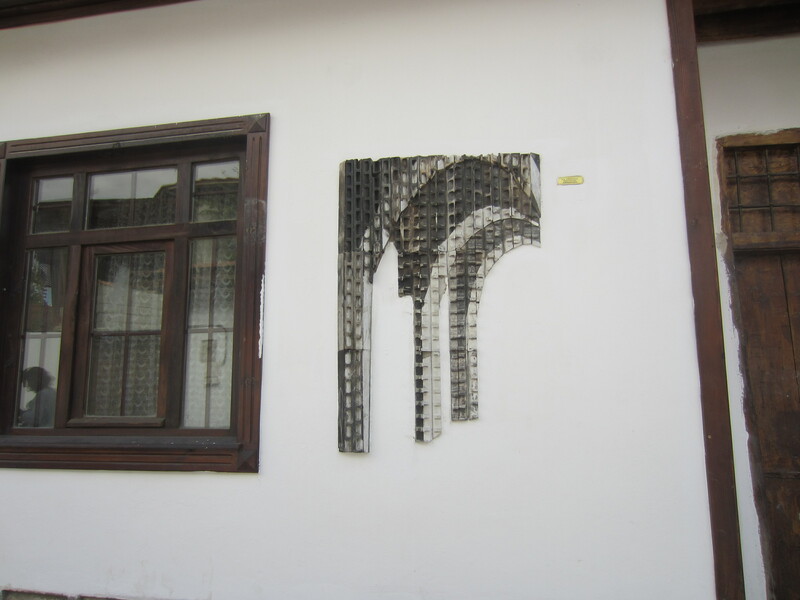 In addition to the gentleman who taught us about ebru, we were able to visit the workshops of a number of artists who now work and give lessons at the caravanserai. Ulu Camii (The Grand/ Exalted Mosque) was built in 1224, during the reign of the Seljuk Anatolian Sultan Alaettin Keykubad I. 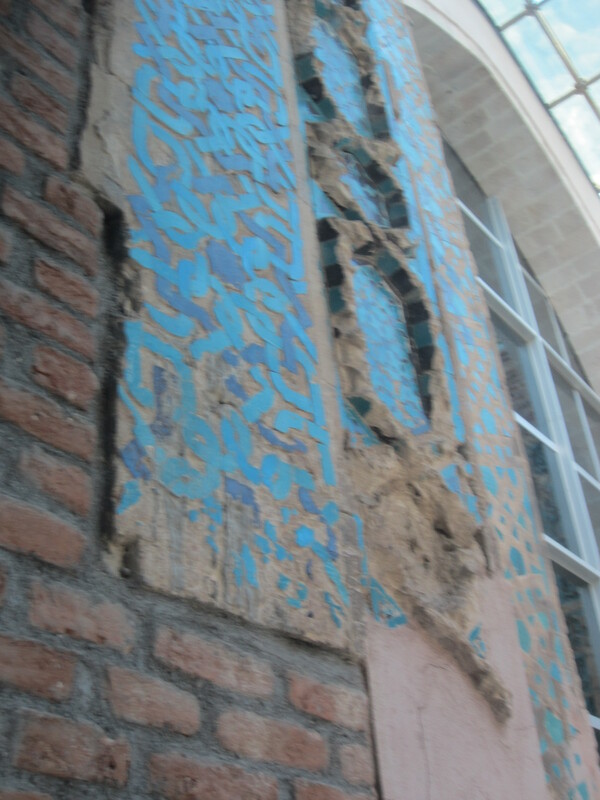 According the placard outside the building, “This structure is unique in the sense that it is the sole Anatolian example of the mosque tradition of the Great Seljuk Empire of Iran, called ‘four-iwan’ plan. 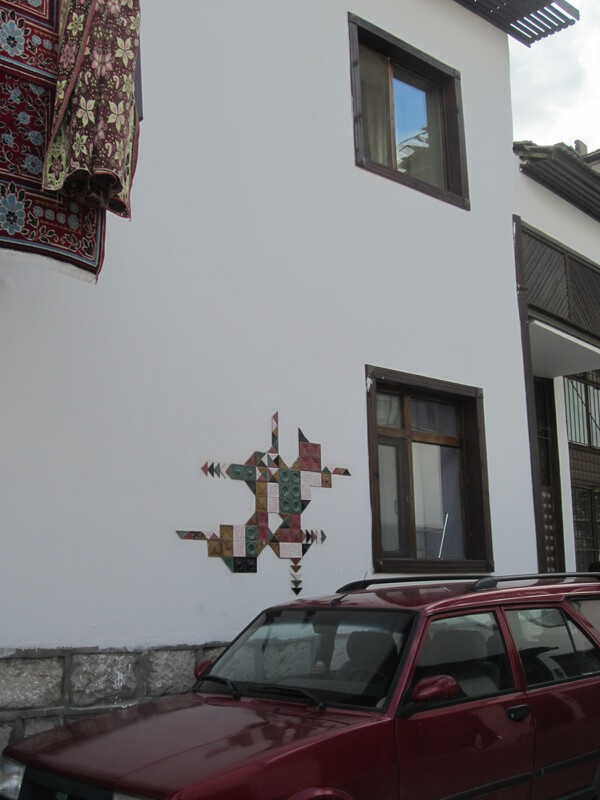 Though this architectural style was known by the Anatolian Seljuks it was not adopted here as it was not suitable for the climate conditions prevailing in this region. 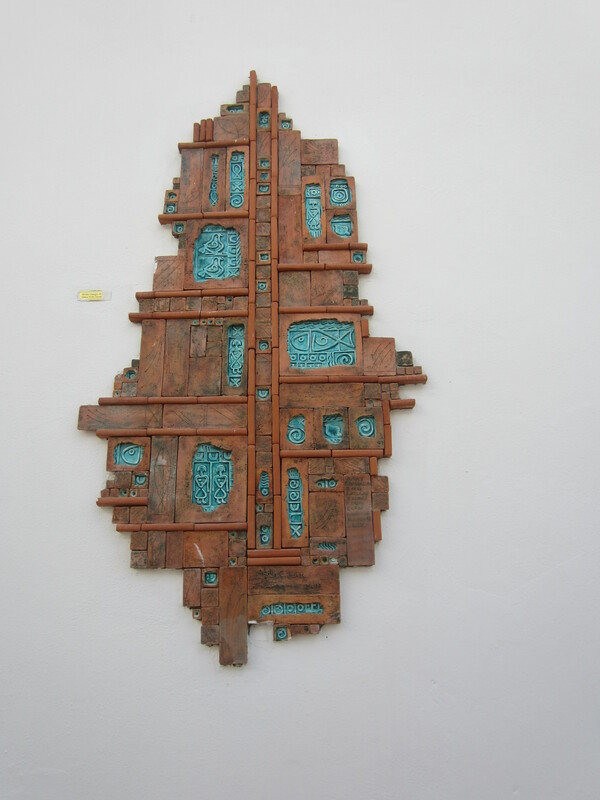 Therefore, the Grand Mosque is the first and sole example of this design.” Among other things, the placard also notes the stunning turquoise and purple mosaics that decorate the walls and inner dome of the mosque, and which were restored in 2007. 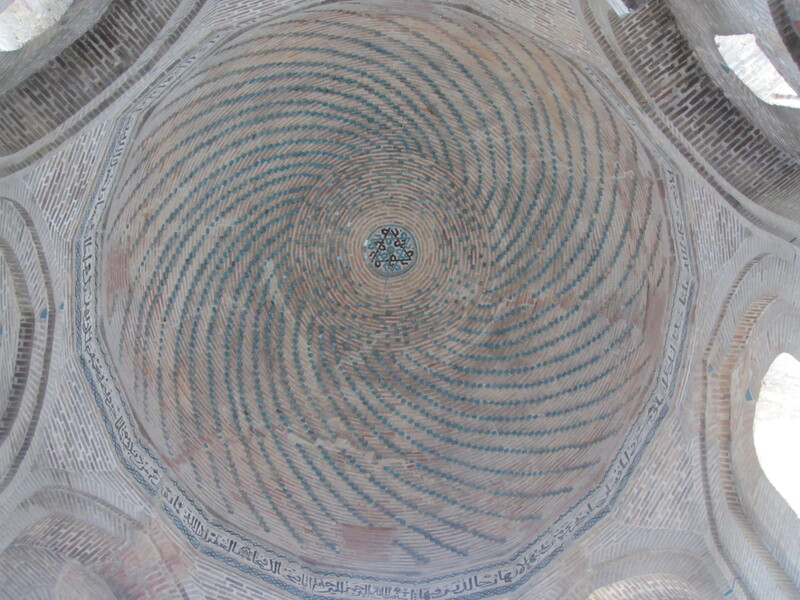 I think it’s rather exciting to note that this was the first mosque I entered in Turkey. 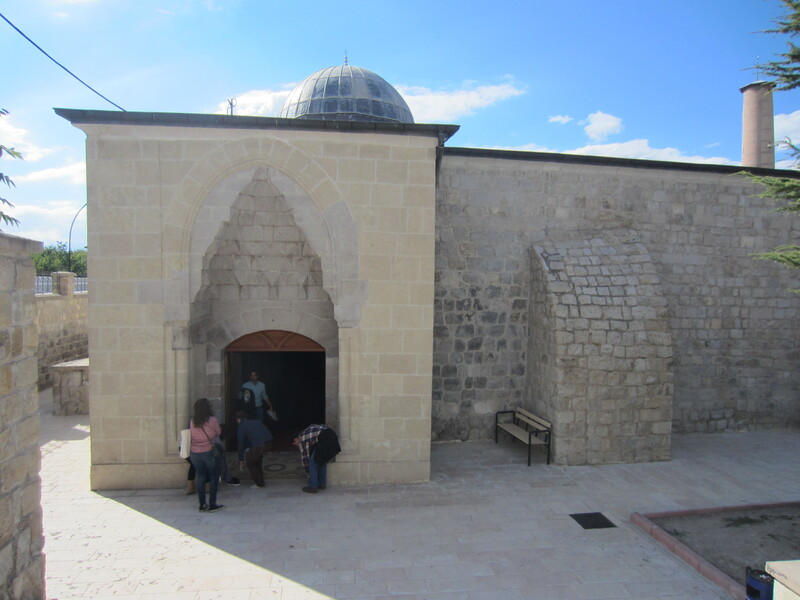 Directly to the south of Ulu Camii is the site of Sahabiyye-i-Kübra ve Suğra Medreseleri (The [Islamic] Theological School of Sahabiyye-i Kubra), constructed during the reign of the Memluk Sultan El Melik-ul Esref Saban (1363-1376), under the direction of Emir Sahabettin Hizir. Though no physical ruins remain of the structure, it is known that religious education was conducted on the site through the 18th century. Other significant nearby sites include the Ak Minare Camii and the Halfetih Minare (Minaret), which both date to the 13th century. 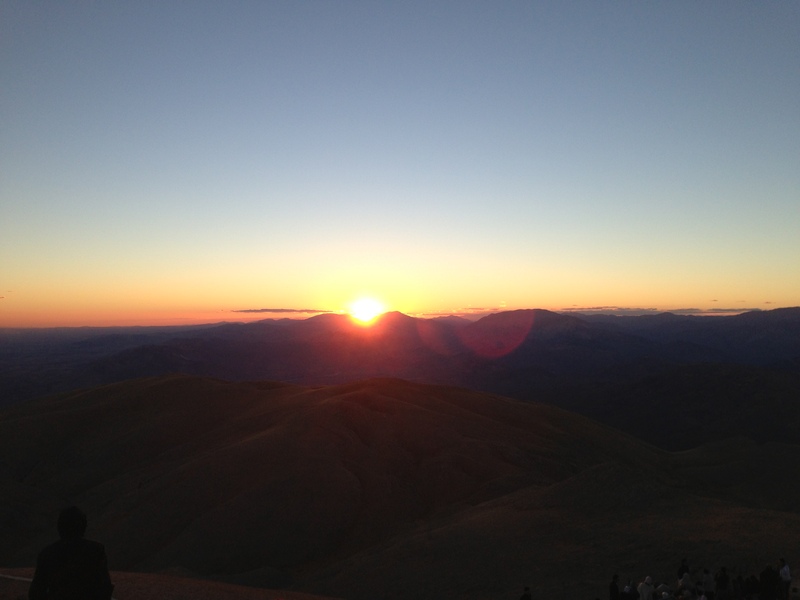 Our adventures that Saturday began at the crack of dawn, as the whole Fulbright crew loaded onto two privately rented minibuses which were to become our home for the next 15 hours of so. 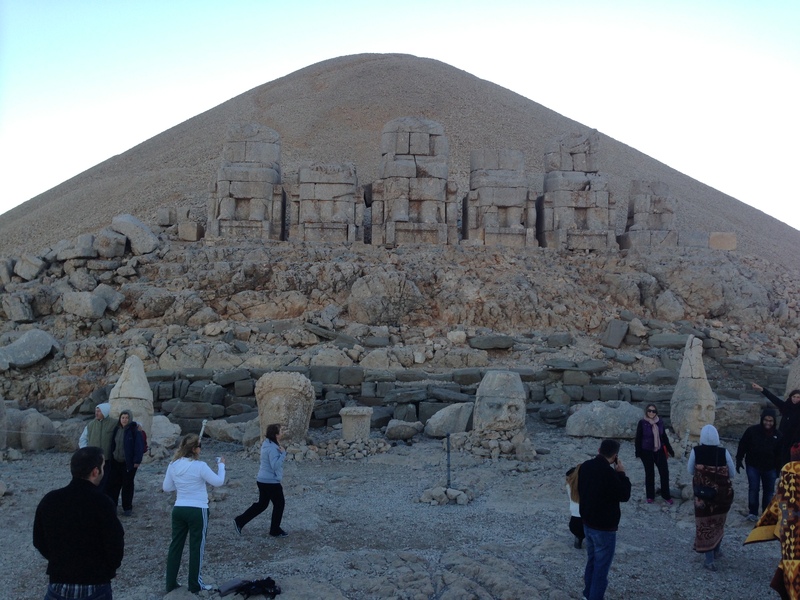 We watched the sun rise from the buses as we set off for the neighboring province of Adıyaman, where we would visit a number of ancient sites, including the magnificent Nemrut Dağı. 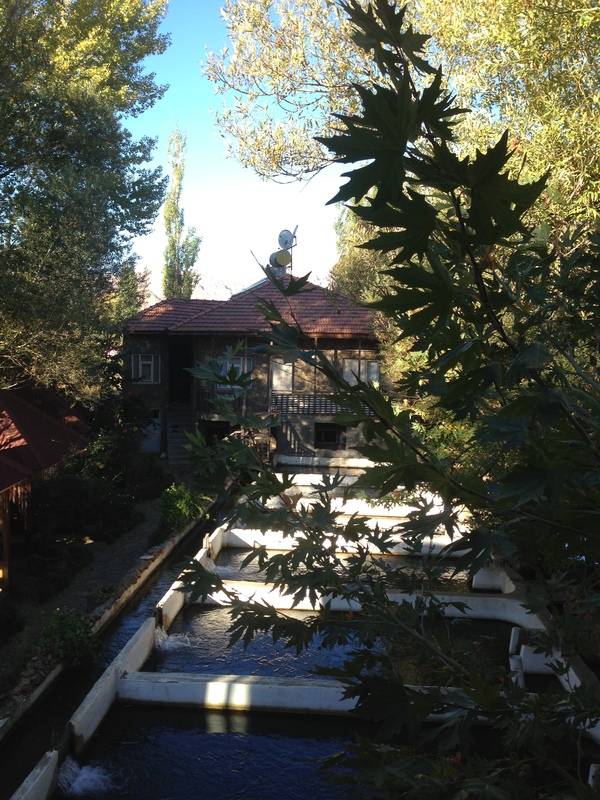 The group enjoyed an outstanding traditional Turkish breakfast at a beautiful wooden restaurant, complete with waterfalls and fish ponds. 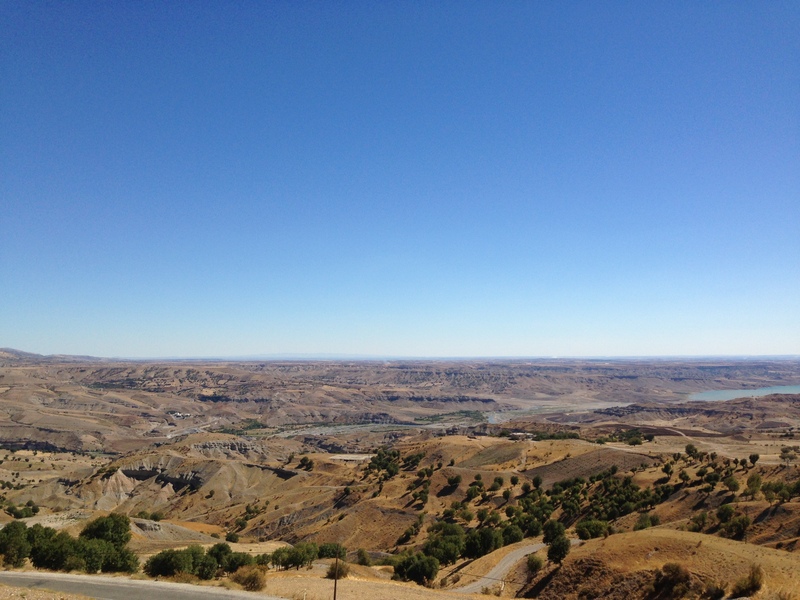 After a few hours on the bus, we arrived at the first site, the view from which was admittedly more astounding than the ruins themselves. 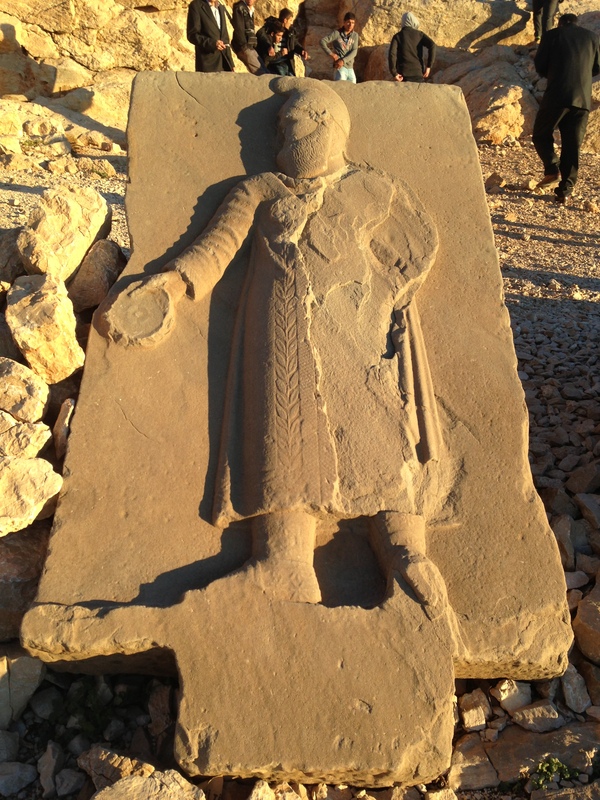 Karakuş Tümülüs (which translates to Monument Grave) was built in 36 BCE, a memorial grave of the Commagene royal family. 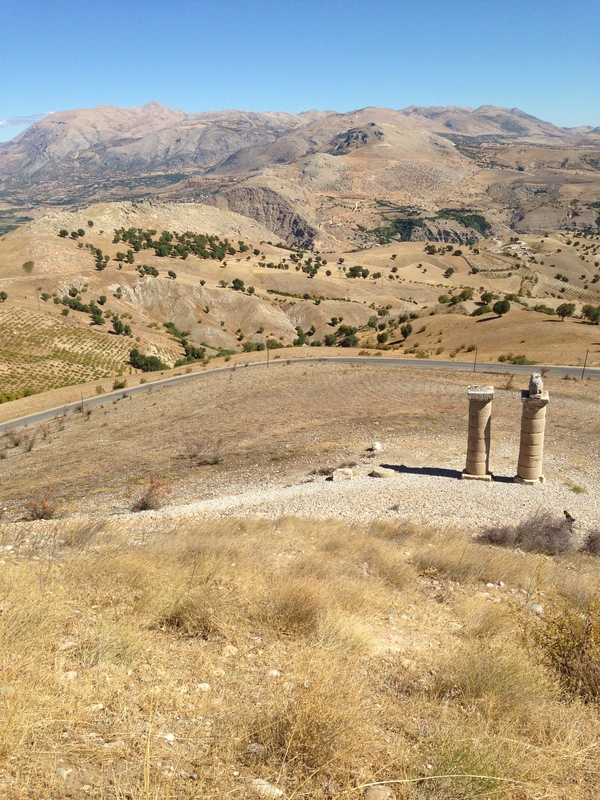 From my Lonely Planet guidebook: “A handful of columns ring the mound- there were more, but the limestone blocks were used by the Romans to build the Cendere Bridge.”(See below) The site has a handful of columns, one topped with an eagle, another with a lion and a bull. A third column has an inscribed slab depicting King Mithridates II shaking hands with his sister Laodike, allegedly explaining that the burial mound holds his female relatives. 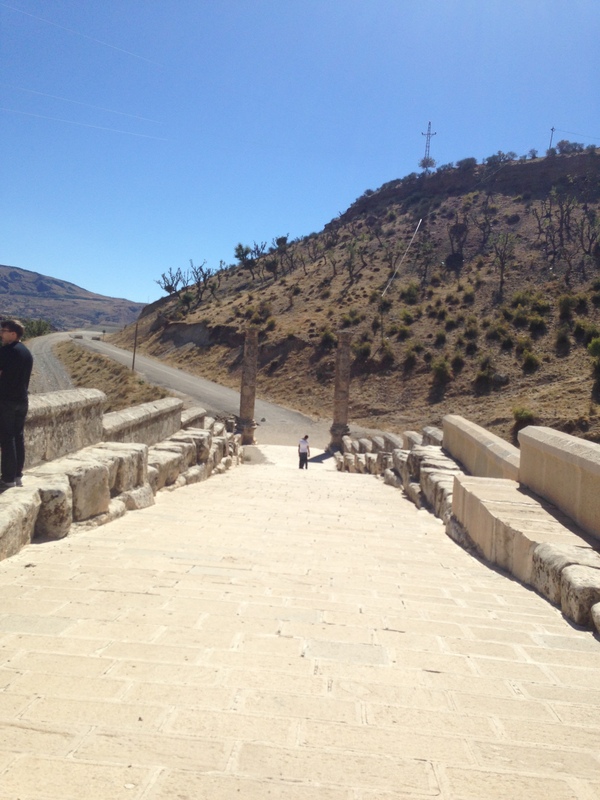 The next site we visited was the Cendere Bridge, built in the 2nd century CE by the Romans in honor of Emperor Septimus Severus. (The bridge was almost immediately rechristened the “Snape Bridge” by we the band of nerds.) 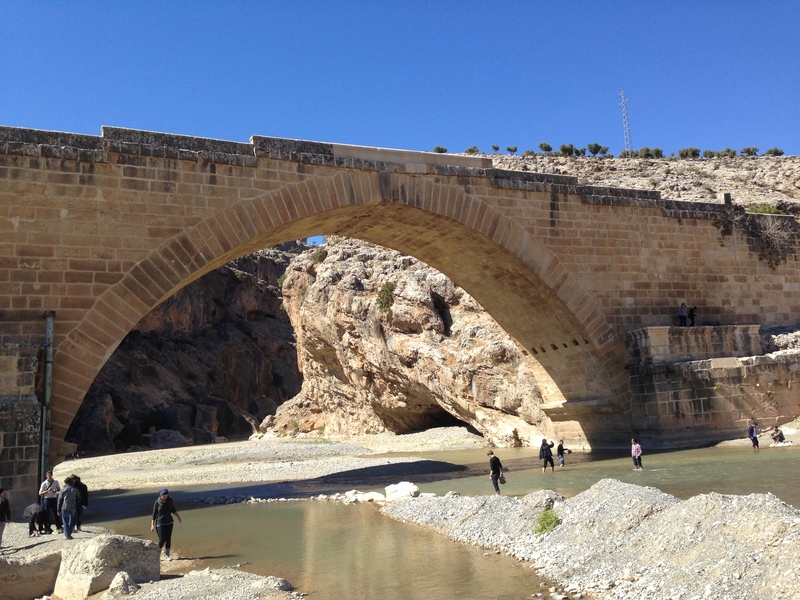 We took the opportunity to soak up some gorgeous sunshine, and some folks even dipped their toes in the Cendere River over which the bridge stands. 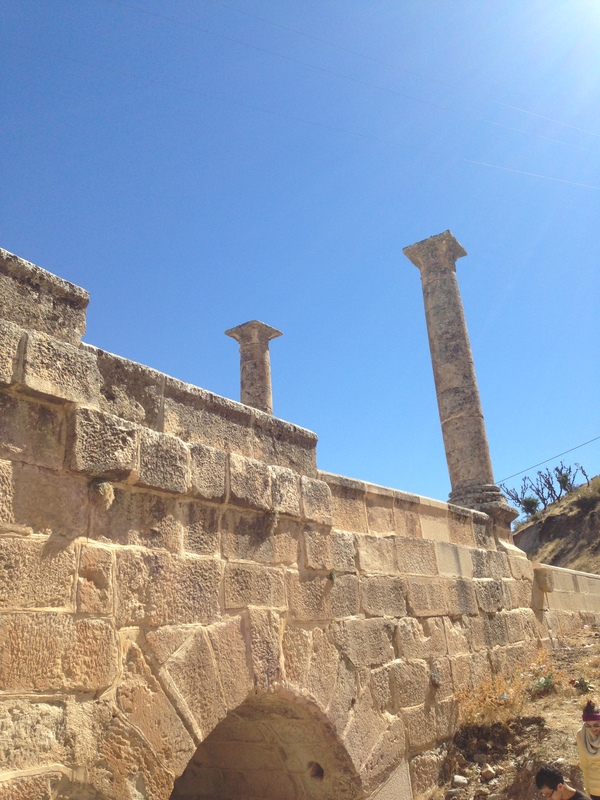 Some of the original Roman columns and stelae remain. 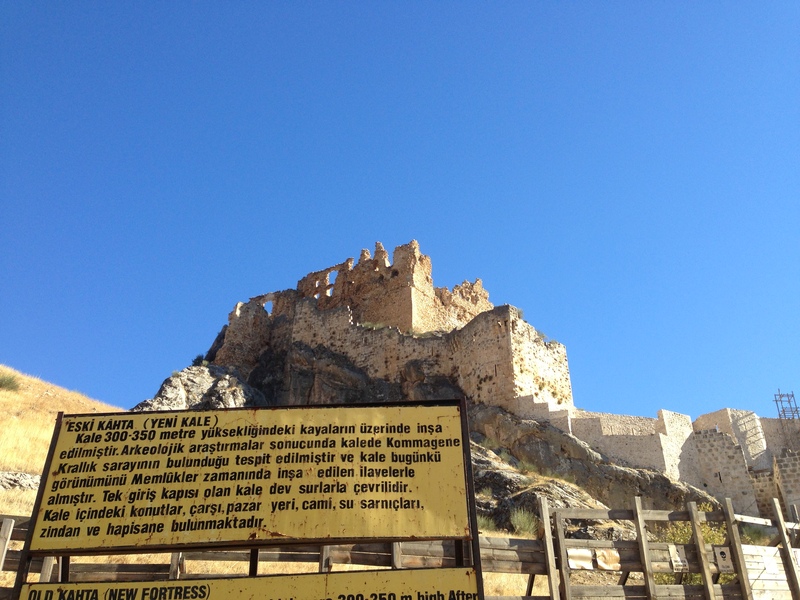 Our journey continued with a stop in a small tourist town closer to Nemrut where we stopped in a grocery store and bought a variety of picnic foods which we would eat for lunch at a tea garden at our next stop, which was Eski Kahta (Kocahisar)/ Yeni Kale (Old Kahta/ New Fortress or Castle). 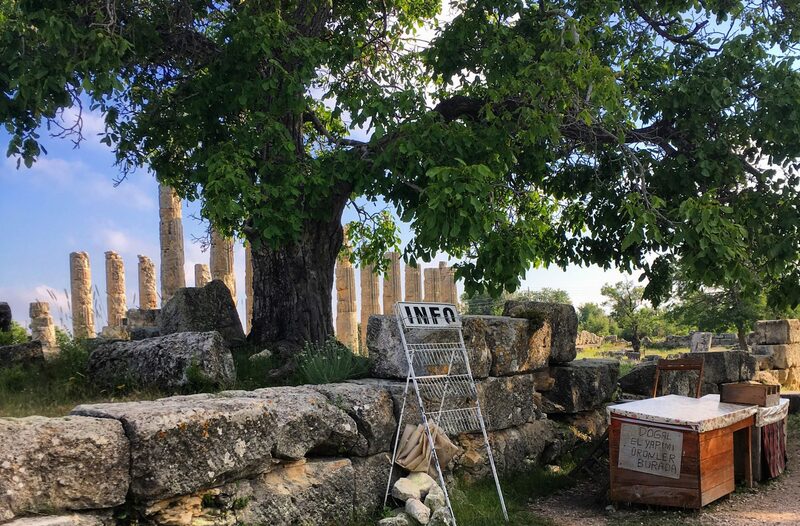 To paraphrase the broken English on the placard outside the site, archaeological research has determined that the palace of the Commagene kingdom was at this location. 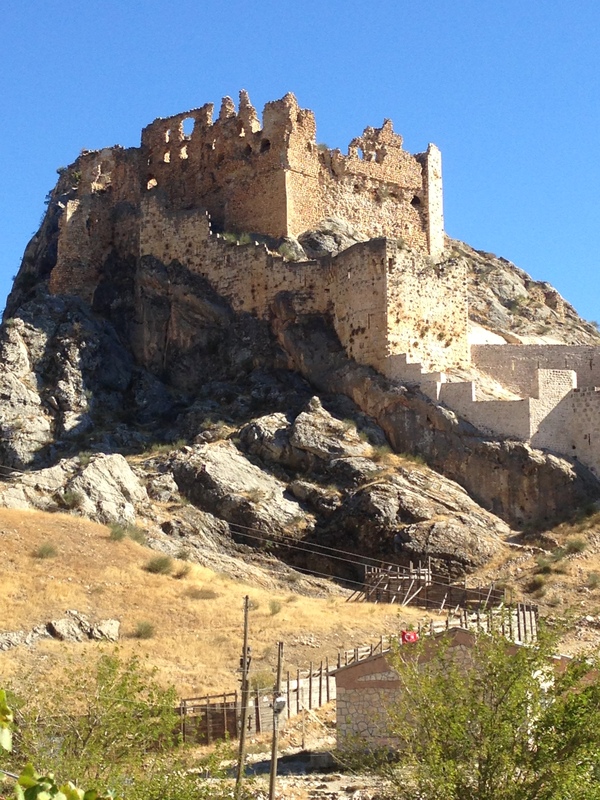 What is now visible are the remains of a 13th century Mamluk castle (hence the name “new castle,” as opposed to an “Eski Kale, old castle” a few kilometers away, which was the site of the ancient Commagene capital of Arsamenia, which we didn’t visit.) The stones used to build this Mamluk fortress were 300-350 meters high, with only one entrance. 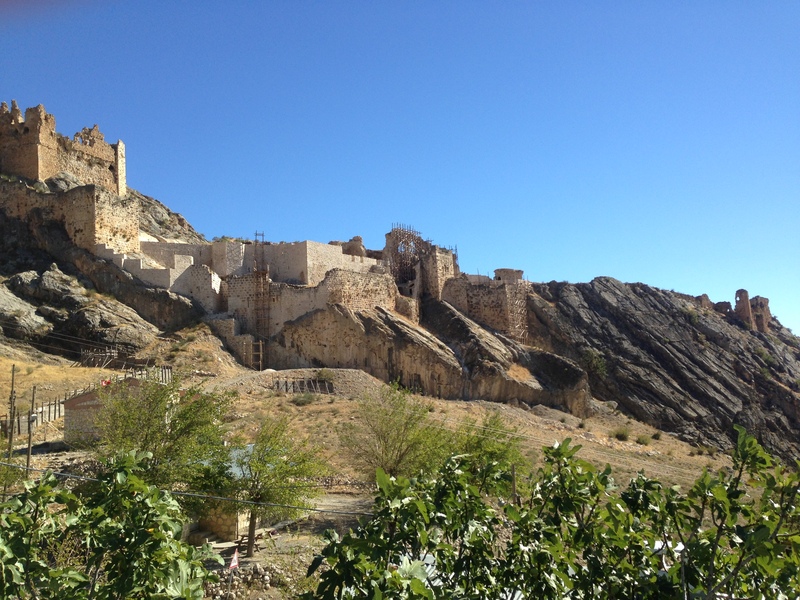 Inside the castle are the remains of water tanks, a bazaar and marketplace, a mosque, and a prison. Unfortunately, due to a massive renovation project which is currently underway, we were unable to enter the site, but I was able to snag some pictures of the exterior. 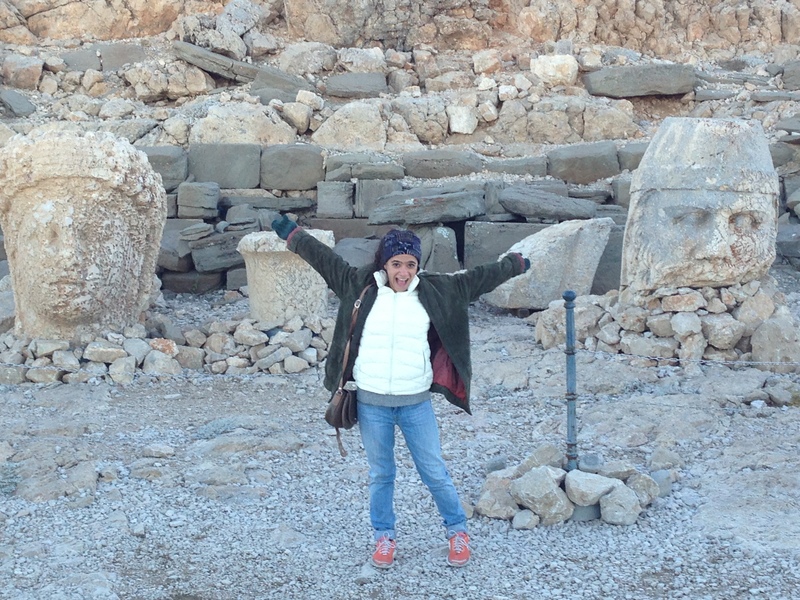 The Hierotheseion of Antiochos I is one of the most ambitious constructions of the Hellenistic period. Its complex design and colossal scale combined to create a project unequalled in the ancient world. 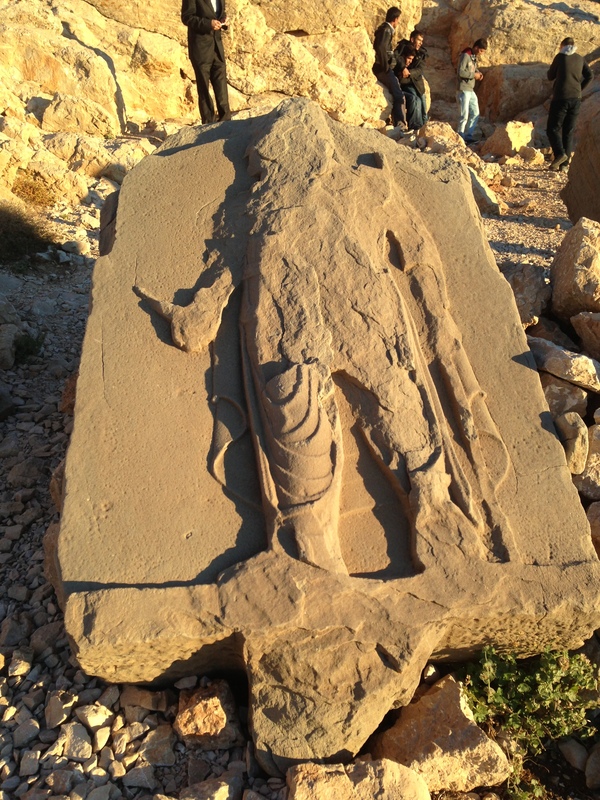 A highly developed technology was used to build the colossal statues and orthostats (stelae), the equal of which has not been found anywhere else for this period. The syncretism of its pantheon and the lineage of its kings, which can be traced back through two sets of legends, Greek and Persian, is evidence of the dual origin of this kingdom’s culture.The tomb of Antiochos I of Commagene is a unique artistic achievement. 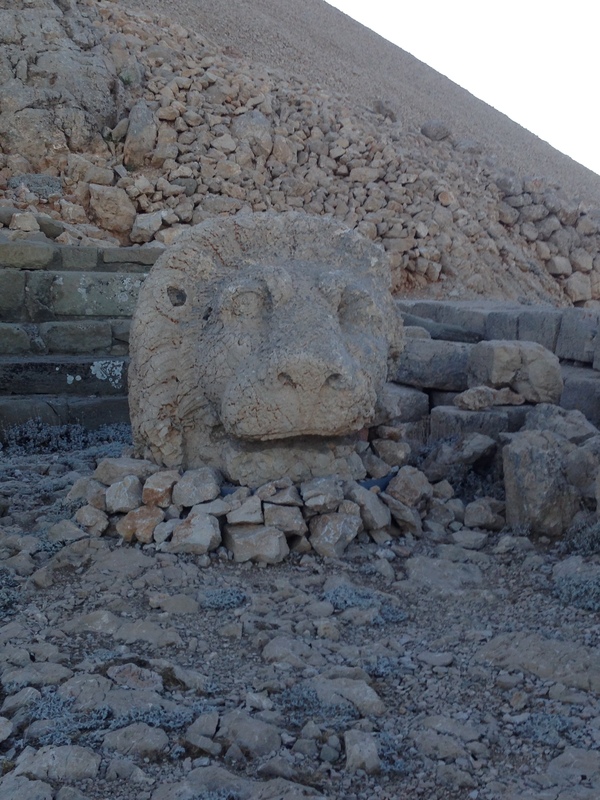 The landscaping of the natural site of Nemrut Dağ is one of the most colossal undertakings of the Hellenistic period (some of the stone blocks used weigh up to nine tons)….Nemrut Dağ bears unique testimony to the civilization of the kingdom of Commagene. 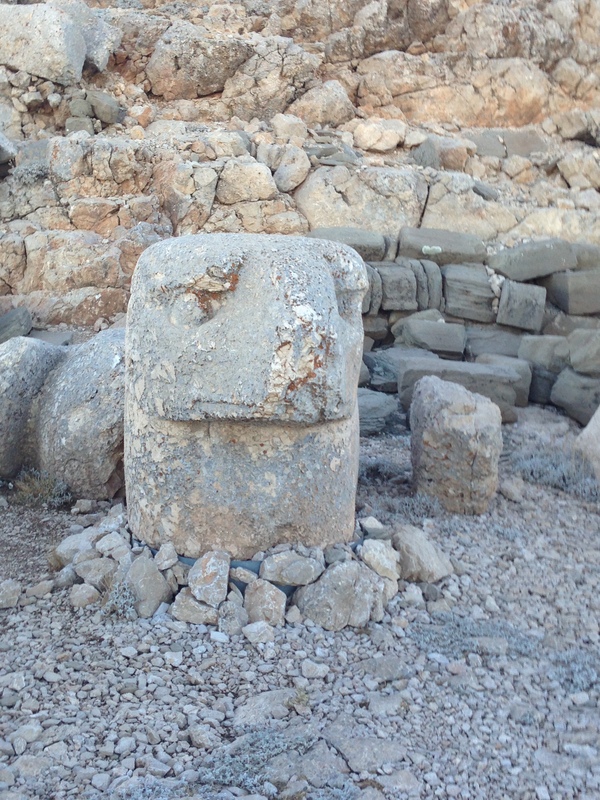 Antiochos I is represented in this monument as a descendant of Darius by his father Mithridates, and a descendant of Alexander by his mother Laodice. This semi-legendary ancestry translates in genealogical terms the ambition of a dynasty that sought to remain independent of the powers of both the East and the West…. 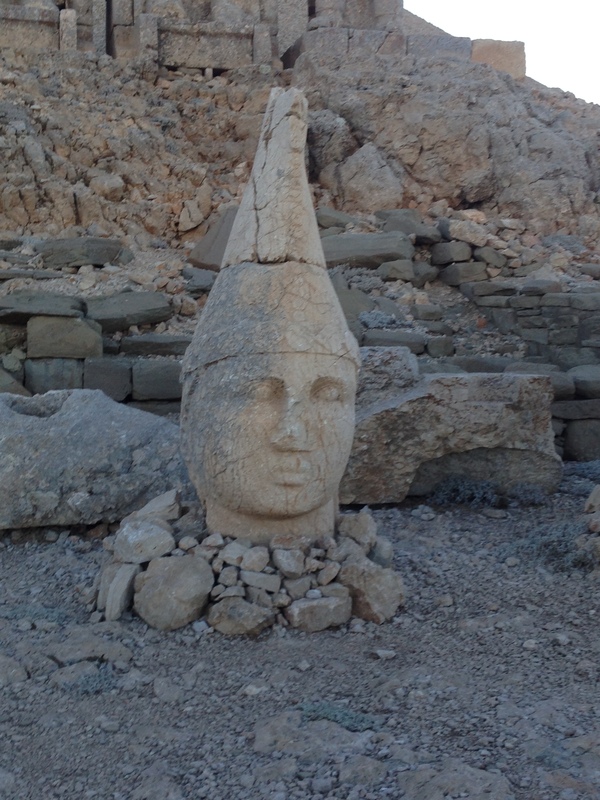 the tumulus at Nemrut Dağ illustrates, through the liberal syncretism of a very original pantheon, a significant, historical period. The assimilation of Zeus with Oromasdes (the Iranian god Ahuramazda), and Heracles with Artagnes (the Iranian god Verathragna) finds its artistic equivalent in an intimate mixture of Greek, Persian and Anatolian aesthetics in the statuary and the bas-reliefs. More plainly speaking, from my perspective at least, Mt. 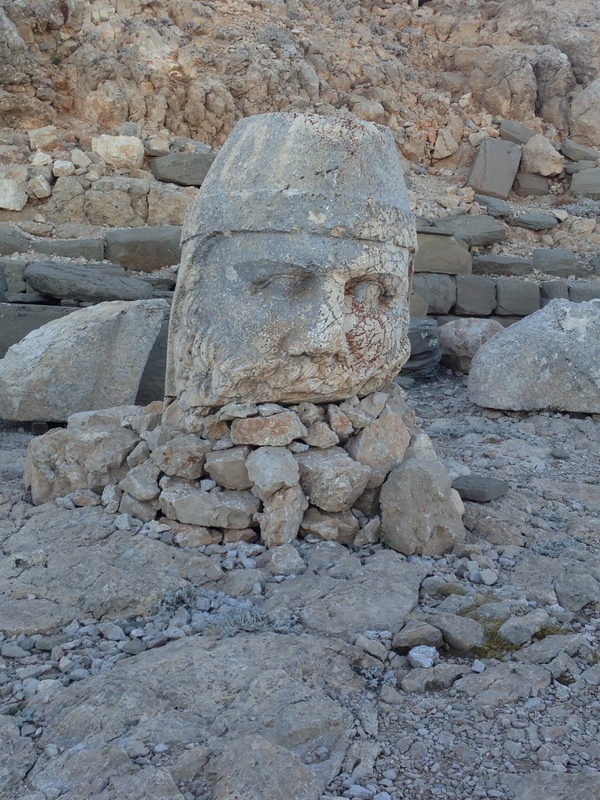 Nemrut is just one example of how the East-West binary so many cling to simply cannot be applied in a paradigm attuned to history. 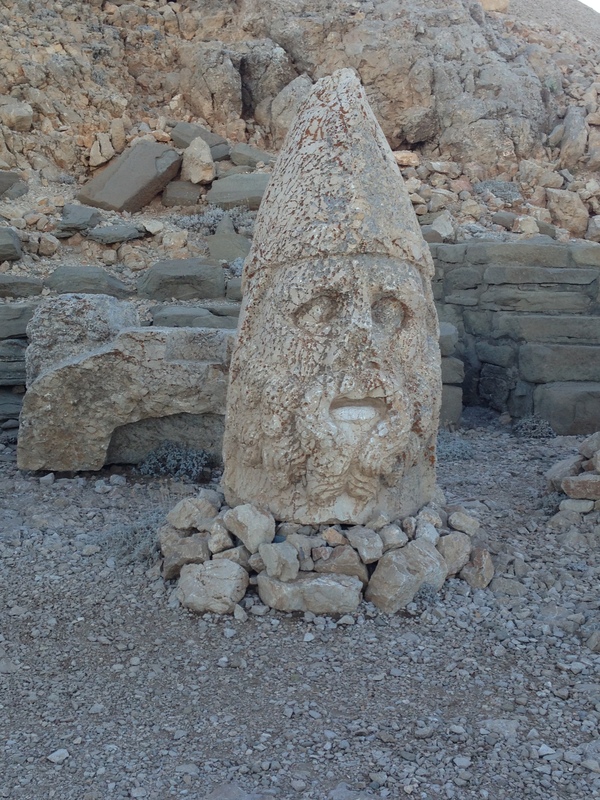 If schoolchildren in the US, for example, grow up learning about Zeus and ancient Greece as the foundation of what becomes “Western civilization,” and here we see that symbology co-existing with ancient Persian mythological figures, in modern day Turkey, what can we say? 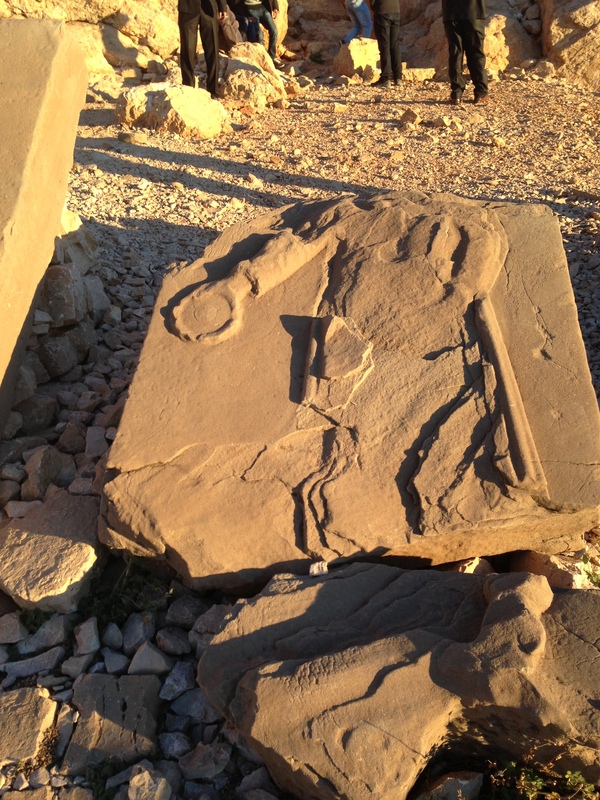 In an essay regarding how these dilemmas should vs do play out in the art history/antiquities world, (regarding Lydian artefacts) author Saba Askary notes, “The artefacts that remain… are effectively ambiguous, as well as being absolutely remarkable in this ambiguity and interconnectivity,(sic) this fact needs to be embraced and celebrated rather than overlooked.” Imagine the good it would do for conceptions of identity, history, the eradication of Orientalizing mindsets, and the contemporary nation state squabbles and “culture wars” currently underway. Inshallah. 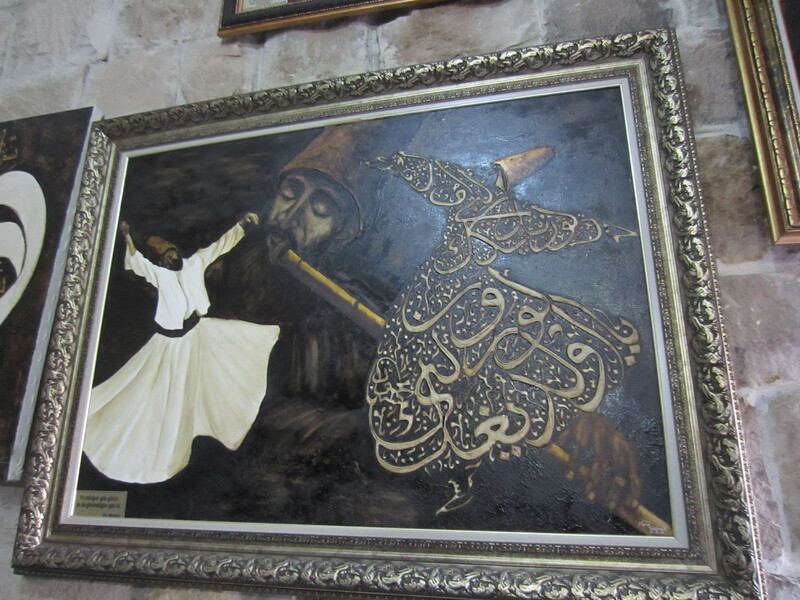 Before leaving Malatya the next day, we had an important purchase to make. Many cities across Turkey are known for particular foods (Aydin figs, Amasya apples, Kayseri mantı, to name just a few examples). 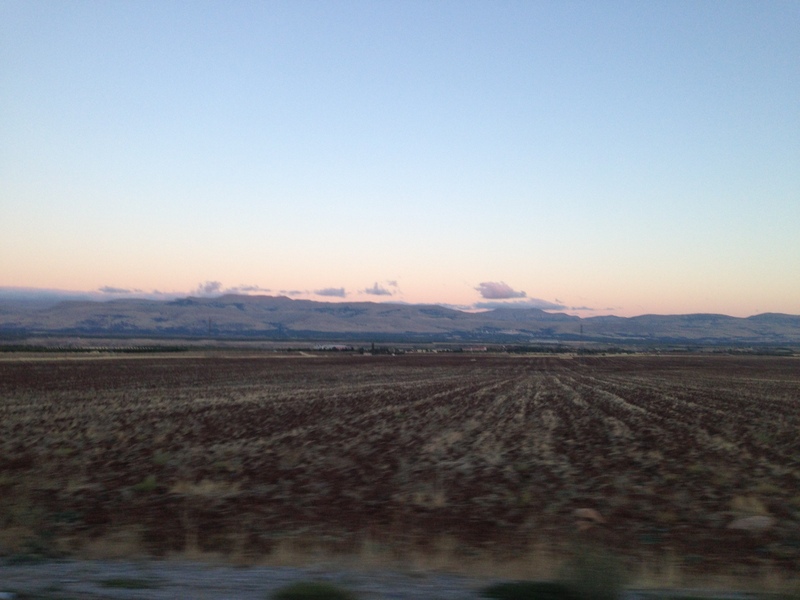 Malatya, as it happens, is the apricot capital of Turkey. Apricot, in Turkish, is kayısi, though I was happy to learn that it is locally known there by the Arabic miş-miş as well. According to Lonely Planet, “after the late-June harvest, thousands of tonnes of the luscious fruits are shipped internationally…” and the K-Town Krew schlepped back no less than 3 kilos of the fruit, dried, back to Kırıkkale to share with our colleagues. At the time of writing, I estimate that we still have at least a kilo and a half to go. 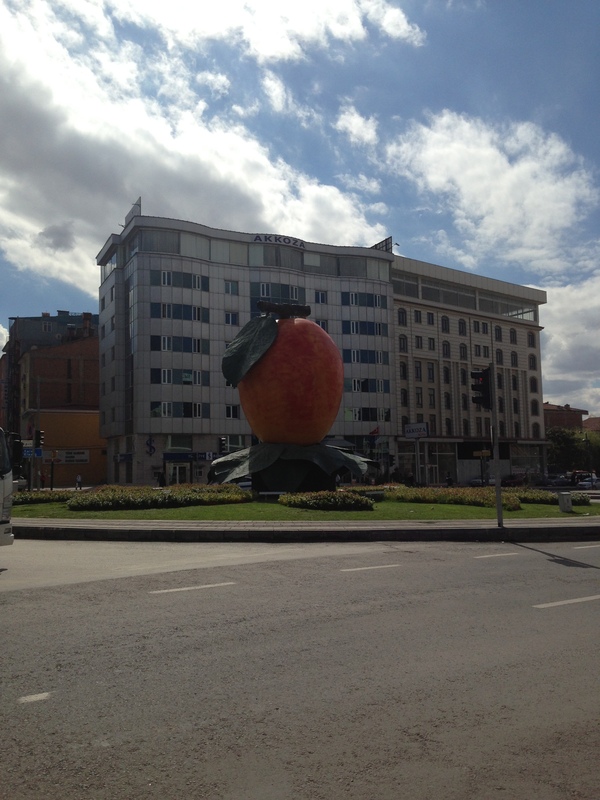 Malatya is very proud of its apricot production: the fruit graces the city logo, which adorns buses, flagpoles, streetlights, etc., and in the city center there are two massive statues of the fruit, which incidentally serve as handy landmarks/meeting points. P.S. The dried apricots we brought back are not the orangey-color one might be accustomed to seeing in the grocery store; they’re more of a mottled brown, caramel, and deep apricot/orange color. Apparently, dried apricots which retain the color of their fresh counterparts are treated with sulfates in order to do so—if they’re sulfate-free, they’re brownish when dried.